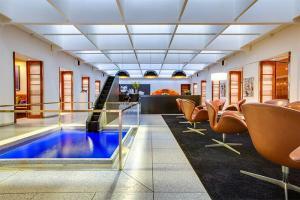 Enjoy a tranquil getaway in the heart of Copenhagen at the Best Western Plus Hotel City Copenhagen. Recently remodeled, the 81 rooms reflect classic Danish design, and are equipped with a wealth of amenities for your comfort including free Wi-Fi, flat screen TVs, coffeemakers and Danish designer furniture. Enjoy complimentary breakfast each morning, and relax at the lounge bar after a long day sightseeing. This hotel is less than a mile from Danish Design Center, and 4 miles from Copenhagen Kastrup Airport.